Cherished Trinkets jewellery is now available to buy on Folksy! ...Yes! 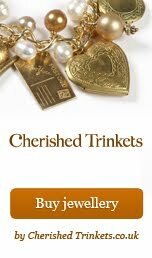 That's right Cherished Trinkets has now invaded Folky, similar to Etsy but in England! Yay! This means no trying to convert prices before you buy because the price is just there in friendly pounds sterling! Hip hip Hurrah! 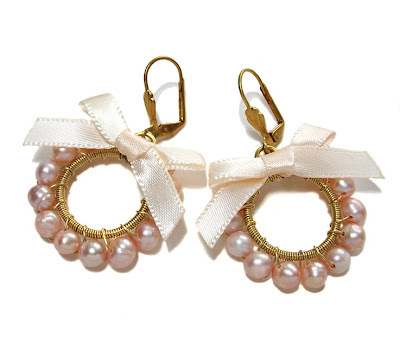 Going onto Etsy and Folksy tonight are these Angelic earrings featuring peachy coloured fresh water pearls, brass and satin ribbon that i delicately wire wrapped in brass. 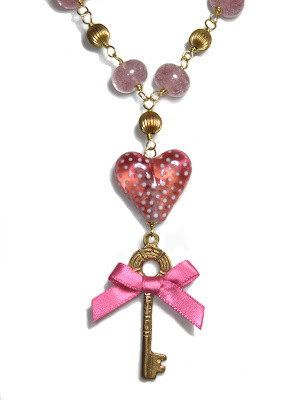 I also wanted to show you my latest 'For Me' necklace creation. 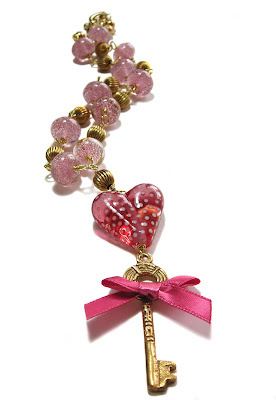 Here I've used one of Laura Sparling's fabulous spotty heart glass lamp work beads that she very kindly sent me a while ago, some lovely pink lamp work beads also by Laura, some brass and some ribbon all finished with a nice vintage brass key. I couldn't sleep the other night because I had this necklace pictured in my head and got round to making it yesterday. I'm very happy with it, in fact I'm wearing it now as I type!